Being a Real Studio developer can be lonely work, especially if you work on your own like many of us do. We often go to client sites, but the project work we do is usually done at home on our own. We are all used to having to work problems out ourselves using the forums, or occasionally by asking questions on the NUG. In May, a client using several of my bespoke Real Studio databases asked me to recommend someone who could support them should I become unable in future. I found another experienced developer and we met a couple of times. It went so well we decided to form a user group in the midlands, UK. 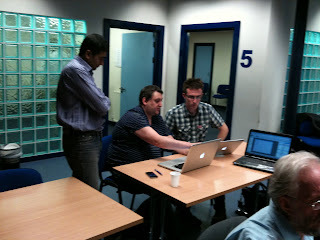 We planned to hold an event in Leicester on July 28th to get some UK-based developers together. After getting the word out through Real Software and Christian Schmitz from MonkeyBread Software, and on the NUG, we hoped to get ten people from England to attend our event. The response was overwhelming and the event quickly sold out. One guy even asked if we had plans to stream the event live so he could watch from the USA! There is clearly a demand for Real Studio developer events and networking meetings. The event was last Thursday. About ten of us socialized together in the hotel the evening before, which was a nice icebreaker. The event went very well. Seventeen developers from England, Germany and Belgium came for the day. The three guys from Belgium found they worked about two miles from each other and lived about seven miles apart! The main reason people wanted to come was to meet other Real Studio developers, to socialize, to discuss technical issues and get help, and meet people who could maybe help in future projects. The presentations were well received. We also had a video chat with Geoff Perlman, who demonstrated the latest Web Edition and also answered our technical questions and talked about the future direction of the IDE. The benefits for me have been great. I discovered lots of simple but very useful things I didn’t know. I’ve also made useful contacts and have new development and training opportunities to explore. I learned how to make some of my coding quicker and easier, and got fresh ideas for my own projects. I now know how to get around some technical issues I had been struggling with and I helped a few other developers get over a technical problem too. It’s been a breath of fresh air. I have new contacts and feel energized. You don’t have to be alone if you work for yourself. You can get involved with a user group, and go to meetings. You can work out answers to your issues with others, find out how to do things better, and help others with their issues. You never know where it could lead.